I recently re-activated my public library card. 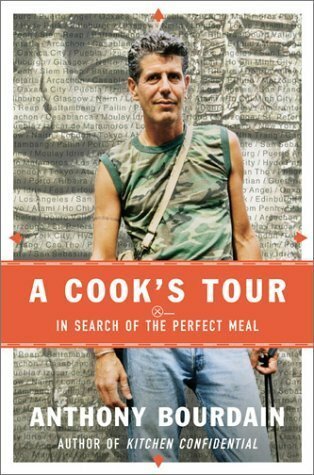 Perusing the aisles I found Anthony Bourdain’s book A Cook’s Tour: In Search of the Perfect Meal. I’ve seen it on many websites and decided to check it out. Right now I’m on the second chapter called “Back to the Beach”, Bourdains trip back to his hometown in France and finds that almost nothing remains the same of how it once was. The first chapter where Bourdain recounts a trip in Portugal was interesting. I have never known much about Portugese cuisine and his chapter on his viewing of a pig festival intrigued me. Bourdain’s writing style is very personal, I feel like he’s sitting right next to me telling me his stories as I read. The way he describes things is vivid enough so that you can visualize what he describes. I’ll post my thoughts here and there as I keep reading his book. I’ve requested his other books as well as Adam Richman’s America the Edible. Looking forward to these reads. One quote I particularly like from Bourdain’s book so far is “Context and memory play powerful roles in all the truly great meals in one’s life”. What makes the perfect meal to you?